What started off as a pre-schooler's music group visiting a residential aged care home to perform songs has evolved into a more interactive visit with residents and pre-schoolers spending time together in a one-to-one way. For the past eighteen months or so energetic pre-schoolers from Emali Child Care Hectorville have been visiting Milpara Residential Living and residents with the aim of bringing generations together and keeping residents connected and engaged in their local community. 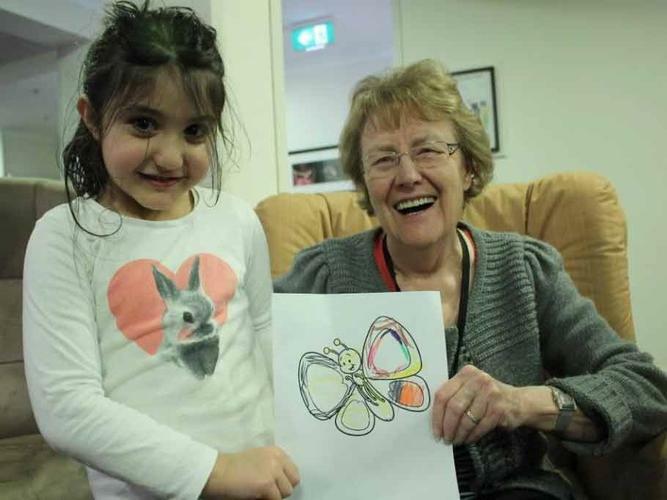 The pre-schoolers and residents alike enjoy drawing pictures and colouring them in together, and the children also continue to sing some of their favourite songs to keep people entertained. “Introducing the colouring aspect means the kindy children are more engaged with residents instead of residents just watching them,” explains Daniel Antonella, Mipara Residential Living coordinator explains. As well as been good for social aspects, colouring also has other benefits. Commenting in a Huffington Post article, psychologist Glorai Martinez Ayala says the action of colouring in involves both logic, by which we colour forms, and creativity, when mixing and matching colours. “This incorporates the areas of the cerebral cortex involved in vision and fine motor skills," she says. Many people find colouring books very therapeutic and some argue it may delay or prevent the onset of dementia in older individuals. Emali Child Care Hectorville Director Leanne Barker says the program has been a great success. “It’s a great opportunity for us to connect with the community and I think it’s also a good experience for the children to go out and meet different age groups,” she says. Mr Antonella highlights some of the residents don’t have grandchildren and others were former teachers and were used to children been around, so they really looked for to the visits.